Eric Carle Research Papers explore the life of one of the most celebrated children's books author,and his most famous book The Very Hungry Caterpillar. 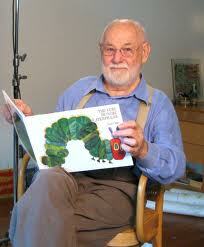 Eric Carle is one of the most celebrated children’s books author and illustrator of our times. Paper Masters will custom write you a research paper on Carle's works, his life or any aspect of children's literature you need. Carle has published over 50 books and has illustrated countless others. His work has been translated into thirty languages and he has sold over 45 million copies worldwide. His most famous book, The Very Hungry Caterpillar, published in 1969, has been translated into over 25 languages and sold 15 million copies. Today over 70 years old, Eric Carle continues to create from his studio Northampton, Massachusetts. Mr. Carle was born in Syracuse, New York on June 25, 1929. The son of German immigrants, Eric Carle returned to Stuttgart in Hitler’s Germany in 1935 because his mother missed the warm circle of a large extended family. Their timing was uncanny. In 1939 the war broke out; Carle’s father was drafted and they would not see him again until he returned from Russian POW camp in 1947. In 1944 the family was evacuated from Stuttgart; Carle spent the rest of the war digging trenches with Russian and Italian POW s on the Siegfried line. Eric did not like school in Germany. The sunny Upstate New York classroom was replaced by, in Carle’s words, “narrow windows, a hard pencil and a small sheet of paper.” But Carle did take a liking to art class, and his art teacher, a Herr Krauss, introduced him to the then forbidden works of artists such as Picasso, Klee and Matisse . After the war Carle enrolled in the Akademie der bildenden Kunste in Stuttgart, from which he graduated in 1950. In 1952 Carle returned to America – but at the ripe age of 23, he was soon drafted and sent back to serve on a U.S. army base in Stuttgart. There, he met his first wife, Dorothea Wohlenberg, with which he had his two children, Cirsten and Rolf. Back in the U.S., he joined the New York Times, where he worked from 1952 to 1956 as a graphic designer. From 1956 to 1963 he was an art director with the advertising firm of L.W. Frolic, but in 1963 he abandoned the professional career path in favor of work as a freelancer. Nazi Germany - Nazi Germany research papers examine the Nazi Party after World War I and the social and political devastation that overtook the German people due to Hitler. Adolf Hitler research papers look at a psychoanalysis of a madman in world history during World War II. Expressionism Art - Expressionism Artists include Wassily Kandinsky, Franz Marc, Paul Klee, and August Macke. Fishing in Children's Books - The purpose of this assignment is to facilitate familiarity with the children's literature that you will integrate in your unit plan (on FISHNG). Arnold Lobel - Arnold Lobel Research Papers discuss this author's children's books, and looks at a book called Frog and Toad Together. Worlds of Childhood - Go to a children's book store or to the children's section of a large book store such as Chapters or Indigo Books. Book Censorship - One of the most frequently challenged books in recent years is the children's book Mommy Laid an Egg: or, Where do Babies Come From? Illiteracy in the United States - The paper should also include statistics and quotes about the positive effects of providing children books at an early age and how doing so fights illiteracy. Early Literacy - Order a research paper on literacy from Paper Masters. Paper Masters writes custom research papers on Eric Carle and explore the life of one of the most celebrated children's books author,and his most famous book The Very Hungry Caterpillar.